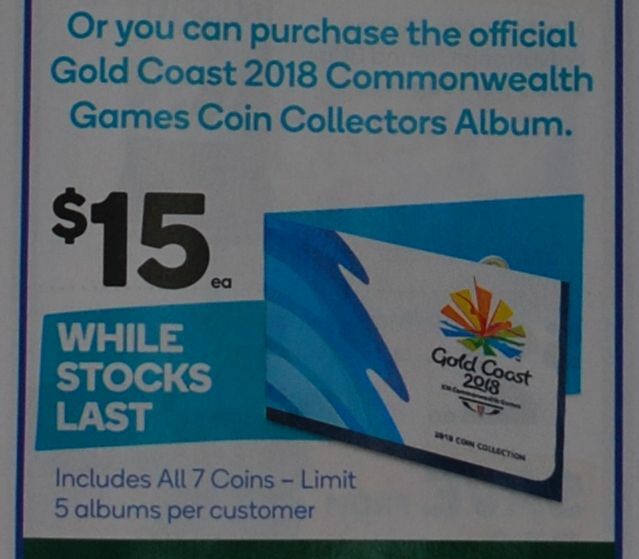 The Royal Australian Mint has struck Gold Coast 2018 Commonwealth Games circulating coloured 2 dollar coins that will be distributed through Woolworths and Safeway supermarkets. There are 3 coins to be released over the coming weeks, the first orange/yellow/red coin may appear in your change when you make a purchase from tomorrow. 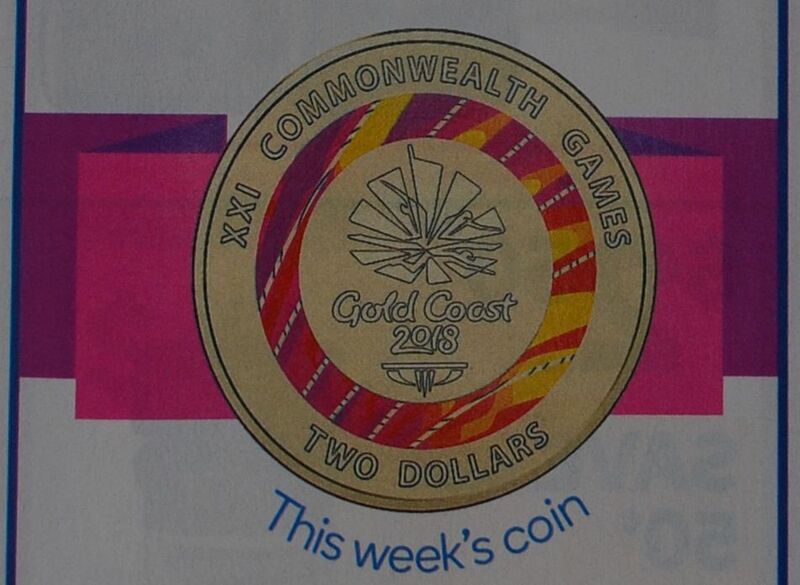 The Week 1 (first coin) has a multi-coloured ring with the Gold Coast 2018 Commonwealth Games emblem in the centre. It is available from March 14th. 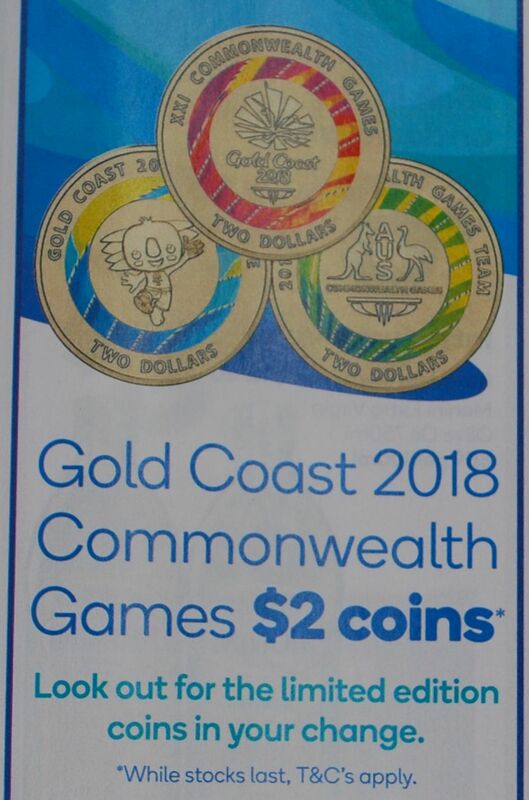 Week 2 from March 21st the blue/yellow coin will be available which features the Commonwealth Games mascot Borobi. Week 3 from March 28th (and for 3 weeks) the last coin will be available. This green/yellow coloured coin features the Commonwealth Games Team logo. The catch is that there is no guarantee you will receive one of these coins in your change. It’s a bit of a lottery with the self service machine or you could ask your checkout operator if they have any in the till to give you. I expect that limits would apply to this as has been the case in the past. Not all staff adhere to this so you could expect a different answer from staff in different stores. All 3 coins will also be available in a special folder 7 coin collection that also has 4 uncoloured $1 coins for $15 a set. Images courtesy of the Woolworths catalogue that appeared in my mailbox today!